A new study on a large cohort of kidney cancer patients in Europe sheds light on the genetic architecture of the disease — and reveals an apparent link between exposure to aristolochic acid and incidence of kidney cancer, particularly in Romania. The research, by an international team led by scientists from the McGill University and Genome Quebec Innovation Centre in Montreal, underscores the importance of investigating possible sources of exposure to aristolochic acid. The compound, found in plants of the Aristolochia genus, also has been suspected of causing a kidney disease known as Balkan endemic nephropathy, affecting people along the tributaries of the Danube River in Croatia, Bosnia and Herzegovina, Serbia, Bulgaria and Romania. Aristolochia clematitis, or European birthwort, is a common plant throughout the Balkans. 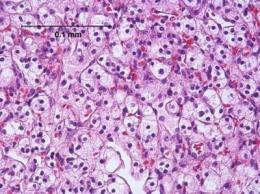 Results of the study, which focused on the most common form of kidney cancer — clear-cell renal cell carcinoma — are reported inNature Communications. Renal cancer accounts for 2.4% of all adult cancers and more than 140,000 deaths annually. Incidence rates have been increasing sharply, with the highest rates occurring in Central Europe.